Snapchat is expanding the use of its Bitmoji characters -- specifically "Friendmojis" -- for iOS users in the coming days. 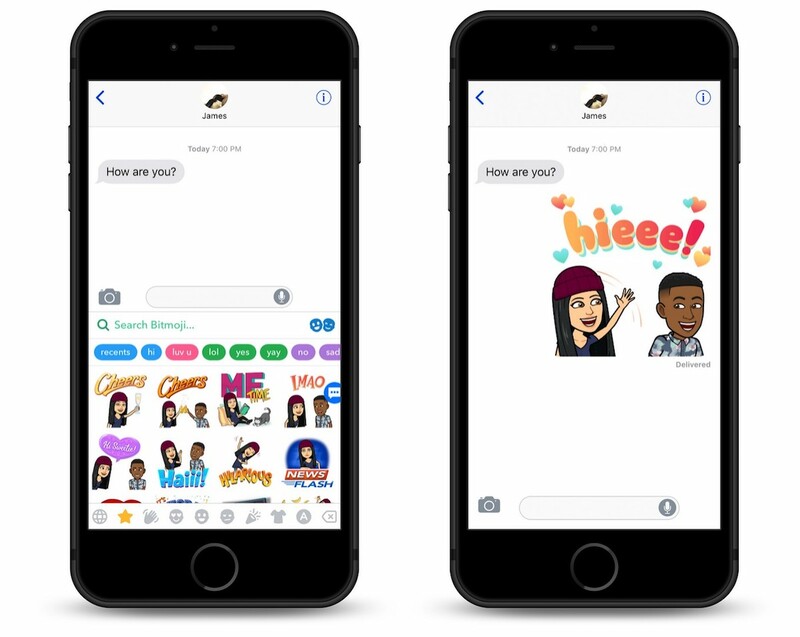 With the update, iPhone and iPad users will be able to send personalized Friendmojis, or Bitmoji stickers that include both you and your friend, directly in Apple's Messages app. Currently, Bitmoji is available as a keyboard extension and a Messages app so users can send Bitmoji in Messages, but the new update marks the first time combo Friendmojis can be sent outside of the main Snapchat app. Anyone who has their Bitmoji and Snapchat accounts linked together will be able to send Friendmojis in Messages. To send a Friendmoji, a new "Friend" icon will appear in the upper-right corner of the Bitmoji keyboard extension, which can be added to trusted keyboards in the iOS Settings app. From there users will see a list of Snapchat friends they can tap on to generate customized Friendmojis featuring their own Bitmoji and their friend's character. Friendmojis have numerous themes and celebratory messages, from simple "Good Morning" messages to more specific stickers for birthdays, holidays, major events, apologies, and more. Snapchat acquired Bitmoji in the summer of 2016, heavily integrating the sticker characters into its app over the years. In 2018, Snapchat now uses Bitmojis as the main form of identifying friends in the app. Since Bitmojis popularized the creation of personalized animated characters, many companies have now unveiled interest in the space, most recently Apple with its own "Memoji" coming in iOS 12 on iPhone X. With Memojis, users can create customized animated characters that look like themselves, and then use the iPhone X's True Depth camera system to replicate movements made by the mouth, eyes, eyebrows, and tongue. Memoji messages can be sent through Messages as stickers and video clips, and can be attached to the user's face in a video clip. Memojis are an evolution of Animoji, which take traditional emoji characters and turn them into full 3D emojis that follow the face movements of the user. Of course, the main difference between Apple's efforts and Bitmoji is Bitmoji's focus on full-body customization, while Apple's animated characters are only floating heads. It's moments like this I realize I've changed demographics. Snapchat saw Memoji and got spooked. What’s the point of this type of stuff? I can’t believe there’s any utility to it. I used to be with it, then they changed what it is. Now what I’m with isn’t it and what’s it seems weird and scary to me. - Grandpa Simpson. Memoji is creepy, not cute. The 3D rendering especially. While I am not sure if that has any bearing my post, I have to disagree. Memoji seems pretty damn cool. About the demographic stuff, all the old people in my family use these too. Actually they use them more than anyone else. Usually for those group texts for Easter or some other celebration. The friendmojis are hella cute, this is a nice addition.